The Elite Dealer Award recognizes the top independent dealers in the country with revenues from less than $5 million to over $150 million and together they reflect the diverse independent dealer channel. The chosen dealers are standouts from the rest of the dealer community because of their product and/or service offerings, innovative marketing programs, community involvement and growth, overall or in a specific segment of the dealership. It’s not just one trait that makes for an Elite Dealer, a combination of traits including, why customers like to do business with the dealership, the little things dealers do to satisfy their customers, as well as how they treat their employees and communities are considered. Its ability to work closely with its customers to leverage new ideas and technology. Rhyme’s people are fiercely committed to bringing positive change to an organization through ongoing training and support. With the launch of its new website this past June, Rhyme has been focusing its marketing efforts online by optimizing its pages, developing relevant content, and making sure the dealership is easily found in online searches. These efforts have already brought many leads via the site that have turned into quick sales. It has received thousands of sincere thank you cards and letters over the years from the organizations and people it touches, whether it be for the time, money, or energy Rhyme has invested into helping them. As a group, the company has a lot of positive energy that’s been instrumental in creating growth, and as a result quality people want to be associated with it. In addition, Rhyme cares about its people and looks to be a compassionate company that will do anything possible to support them. This positive energy extends to its vendors/partners, customers, and its communities, demonstrating to the people who work at Rhyme that they’re making a difference. Its charitable foundation, Rhyme Time, awarded six scholarships in 2016 to graduating seniors who have been affected by cancer. In total, the Foundation has awarded 20 scholarships in six years. 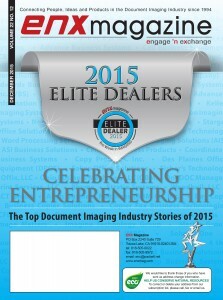 ENX Magazine is a monthly publication dedicated to the document imaging industry since 1994. ENX Magazine delivers exclusive editorial coverage on industry news and trends, market opportunities and issues, company profiles, new products, and industry insights through executive interviews.